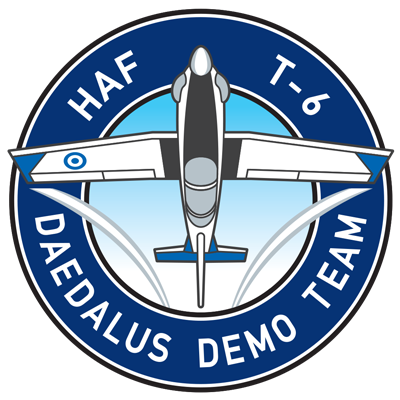 The Daedalus Team was established in 2005 with the intention of displaying the T-6 at the upcoming 'Archangel' airshow at Tanagra. Two USAF instructors came to Kalamata to train five instructor pilots from 361 Squadron in airshow display flying. Two instructors were eventually selected to provide the demonstration and represent the HAF training wing at the show. The training for the display routine began on 26 July 2005. On Sunday 18 September 2005 the T-6A Aircraft Demonstration Team performed its first public display at Tanagra, during the International Air Show "Archangel" in the context of the festivities held to honor the Hellenic Air Force's Patrons, Archangels Michael and Gabriel. Daedalus is now the longest ever lived display team through HAF history! "Daedalus" is enhancing the morale of the Hellenic Armed Forces, while, at the same time, it is showcasing the work of the Hellenic Air Force to the wide public. Inspired by Greek mythology, the team is named after Daedalus, who was the father of Icarus. The name Daedalus originated from the word “δαιδάλλω”, meaning "to work artfully". So, performing a display is, nonetheless, a work of aerial art. Additionally, the team consists of instructor pilots who, like modern Daedalus, pass on their experience, and "give wings" to their student pilots. In 2015, the demo aircraft received a special painting to commemorate the teams 10th anniversary. The upper part of the aircraft depicts a huge waiving Greek flag. The design under the fuselage is based on the Icarus flight close to the sun, according to Greek mythology. Moreover, two of his inventions are displayed on the tail section, the caliper and the maze.